Dining Diaries: Where Does Michael Chiarello Get His Tuesday Night Mexican Takeout? Dining Diaries will ask one chef each week about his or her personal favorite dining spots. Not recommendations, or hawking their co-star’s newly opened whatever as a PR favor. But where a celeb chef goes to eat or drink or brunch or late-night snack or hangover binge on his own time. This week, we grilled Chef Michael Chiarello on his favorite spots. 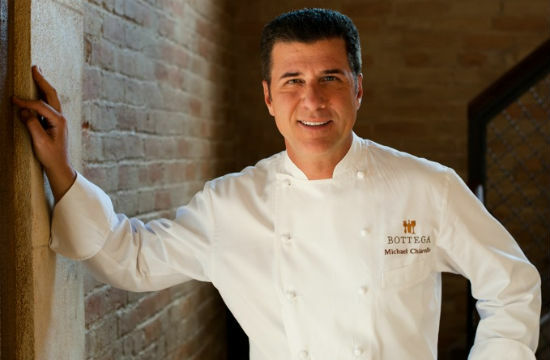 Michael is the chef/owner of Bottega in the Napa Valley. In 1999, he added his own winery to the mix: the Chiarello Family Vineyards. Besides coming in second as a competitor on Top Chef: Masters, he has also judged on various installments of the Bravo franchise. He also competed on The Next Iron Chef, and hosted the Emmy Winning series Easy Entertaining with Michael Chiarello. Outside the kitch, Michael boasts an olive oil line called Consorzio Flavored Oils, and a retail line called NapaStyle, featuring artisanal foods, kitchenware, and home decor. To get an after work nightcap: Bouchon is perfect for a nightcap. It was set up to accommodate the restaurant industry! For a late night meal: I love to get a snack at the kitchen side of the bar at Redd, watching my friend and super chef Richard Reddington finish the night cooking and expediting. For your early morning coffee: Napa Valley Coffee Roasting Company has been a local favorite for 15 years. For a weeknight dinner in the neighborhood: The counter at Cook. My old sous chef, Jade Wilmoth runs this great Italian joint. I sit at the counter and enjoy the show! For dinner with visiting friends and family: My good friend Cindy Pawlcyn’s Mustards has been a Napa stand-out for over 25 years. The food is great and the garden is perfect for kids romping when they need a break. To get your favorite sandwich: I love the ahi burger at Gott’s. Only roadside stand with a stellar wine list. For a lazy Sunday brunch: There’s something about the serene environment of the Bardessono hotel that helps Sundays feel less cluttered. For your weekly grocery shop: Sunshine Market is my go-to favorite for everyday staples and high-end entertaining needs. To order Tuesday night takeout: Azteca Market has some of my favorite Mexican food in the Napa Valley and jet cold beer. To while away a sunny Saturday afternoon: Ah, the deck of Auberge du Soleil. A lovely glass of champagne with an even lovelier wife. Perfect. To celebrate your birthday: The Restaurant at Meadowood. Not only is Chris Kostow the youngest chef in America with 3 Michelin stars, but I adore him and his very personal style of cooking.